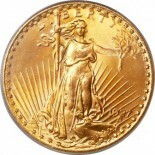 The first Saint-Gaudens double eagles, acclaimed as one of the most beautiful and artistic U.S. coin designs, did not display the motto IN GOD WE TRUST anywhere on the coin. Even though the Coinage Act of 1890 did not include that motto in the list of required wording to be placed on U.S. coins, perhaps an unintended omission, both Congress and the public nevertheless wanted it there. The motto was restored (it was on the previous Liberty Head type) later in 1908 by Congressional action, which brought the double eagle into compliance with the Act of March 3, 1865, the original mandate for the text. 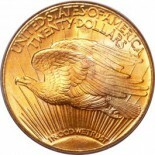 Specifications: Designer: Augustus Saint-Gaudens and Henry Hering (Saint-Gaudens’ collaborator), with modifications by Charles E. Barber Circulation Mintage: high 8,816,000 (1928), low 22,000 (1908-S). Mintage figures may not accurately reflect availability, due to gold coin recall and melting in the early 1930s. Proof Mintage: high 167 (1910), low 50 (1915) Denomination: $20.00, Twenty dollars, Double Eagle Diameter: 34 mm, edge with raised text and symbols- E PLURIBUS UNUM, the words separated by thirteen stars Metal Content: 90% gold, 10% copper Varieties: A very few identified, including 1909, 9 Over 8; and other minor die variations.